If you’re looking for a single piece of fitness equipment that works your entire body and provides infinite levels of intensity, an air bike (a.k.a. fan bike) may be just the thing for you. 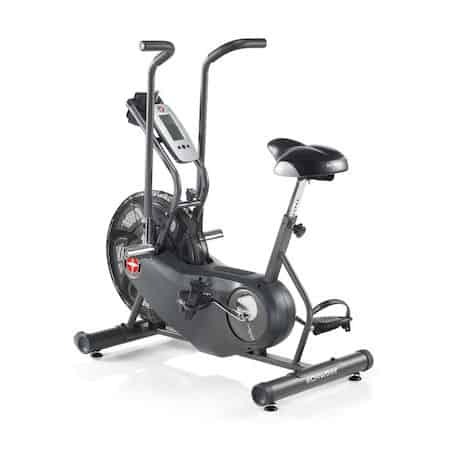 Unlike traditional stationary exercise bikes, air bikes provide a full-body workout; your upper body is worked through the push and pull of the handlebars, while your legs are challenged by the fan. This makes for a cardiovascular challenge like no other, and means that an air bike workout is not for the faint of heart (literally). 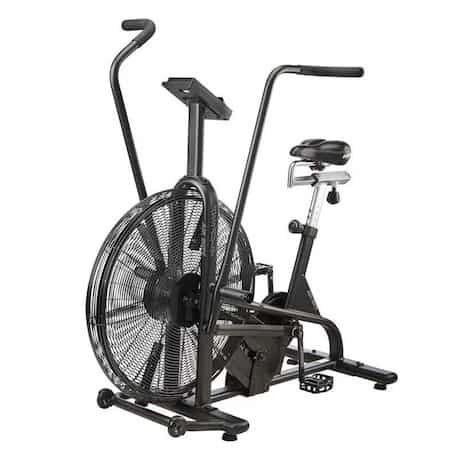 You control the resistance of an air bike through your own effort: As you pump your arms and legs harder, the fan blades move quicker, which creates more air resistance. 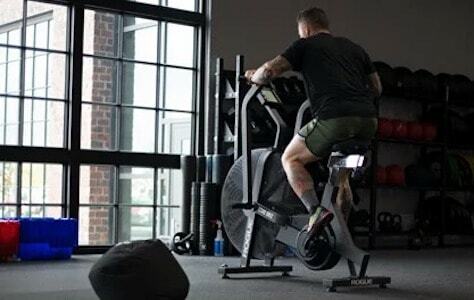 There’s no way to ever get on top of this resistance, which is why a heavy session on a fan bike is about as punishing as a workout can get. This is what make the air bike worthy of nicknames like “the misery machine” and “Satan’s tricycle”. That said, this unique machine is also a surprisingly great recovery tool. 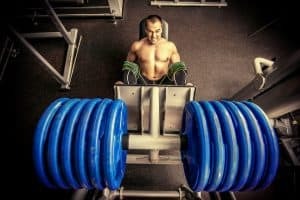 If you experience muscle soreness (i.e., Delayed Onset Muscle Soreness; DOMS) after training, it likely stems from intense eccentric portions of muscle contraction (where your muscles are simultaneously contracting and lengthening, sometimes referred to as the “down phase” of a rep or movement). 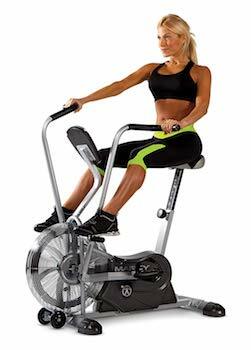 When using an air bike, there is no eccentric muscle contraction. This makes it suitable for completing a recovery routine (though it might not feel like recovery). Even better, it also means that an air bike itself workout won’t cause DOMS – you can get a brutal workout, without the brutal after effects. 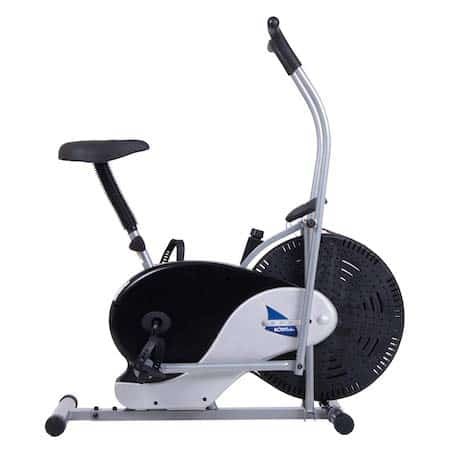 A good air bike is a fantastic and unique addition to any home or commercial gym as it’s one of the only pieces of exercise equipment that truly ensures you get out of it what you put into it. In this article we look at the top 6 air bikes you can currently pick up. At the end of the article we also go through what to look for in a great air bike, and give a quick overview of air bike accessories. What Makes a Great Air Bike? Rogue describes their first foray into air bikes as “overbuilt for a smoother ride.” This should come as no surprise from a company that’s known for their unrivaled precision and build quality. A rock solid steel construction and built-in leveling feet ensure that the Echo is ready for your hardest bursts. A belt drive connects the steel fan to a pair of grippy rubber tread pedals. Display-wise, the Echo is equipped with a high contrast LCD console. With it you can track metrics such as distance, heart rate, calories and track intervals. Custom modes are also available. Each unit comes shipped with all the necessary hardware, tools and batteries to get started. A wind guard and phone holder are available as optional add-ons. The Echo is also compatible with a variety of Shimano bike accessories, as well as Polar heart rate transmitters. 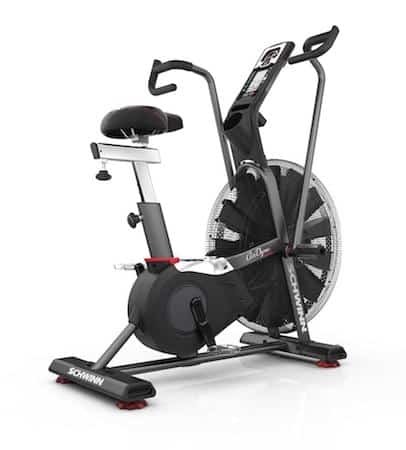 The Assault Fitness AirBike is one of the most popular air bikes on the market. It’s so popular that some people think air bikes are actually called Assault Bikes. It has everything you could ask for in a solid air bike, including a powerful display console and top of the range build quality. A chromoly steel frame, oversized pivots, sealed cartridge bearings and expert craftsmanship ensures that the AirBike will take a beating for years to come. The seat is adjustable six different ways and the handlebars provide a comfortable grip through long sessions. A custom LCD console display is what you’ll be looking at as you power through your workout. Watts, calories, speed, time, heart rate and a plethora of other metrics are available on command. The large display is flanked by suitably large buttons that allow you to interact with the console without stopping your workout. 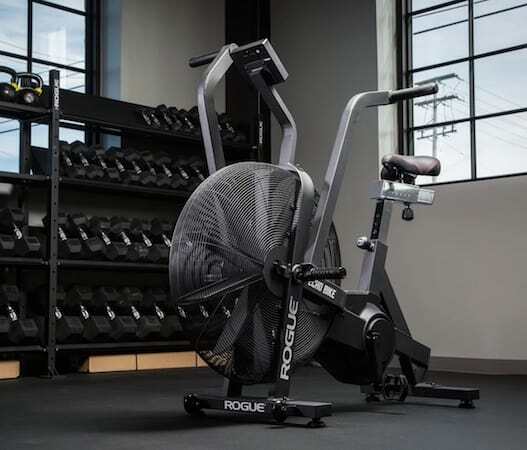 At the time of writing, Rogue Fitness have them for the best price on the net with free shipping. 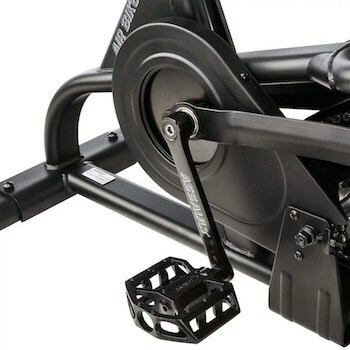 The Airdyne Pro’s custom 26 blade fan is connected to the pedals by a single stage belt drive that provides smooth, efficient movement. Moisture-repellent, double coated steel makes up the framework of this durable air bike. 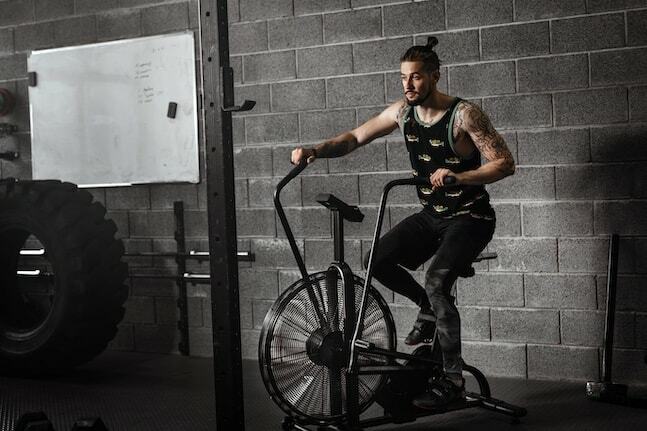 Built-in levelers and enhanced structural support help the Airdyne Pro maintain a solid stance through explosive exercises. Multi grip handlebars and an oversized seat cushion that’s built to provide the perfect knee placement ensures a comfortable workout. If you prefer for your own seat, the clamp system allows you to easily switch over. Noise is significantly reduced thanks to the high quality fan and belt design. A tachometer provides all the metrics you need including RPM, Watts, distance, heart rate and calories.. You can also isolate your upper body thanks to the anti-slip foot pegs. Schwinn’s air bikes are so good that we simply had to include another model in the list. While being a lot more affordable than the Pro, the AD6 manages to maintain a solid build quality and all the necessary features, along with a few unique ones. After less than half an hour of assembly, your AD6 will be ready to go. A frictionless fan and single stage belt drive keep things running smoothly and quietly. Comfort features such as foot straps and self balancing pedals, along with a water bottle holder come standard. Additional accessories such as a reading rack and wind screen are also available. Two transport wheels and a polycarbonate outer shell make the AD6 easy to move around. The included LCD display is clean, intuitive and provides all the basic and advanced metrics you need for your workout. 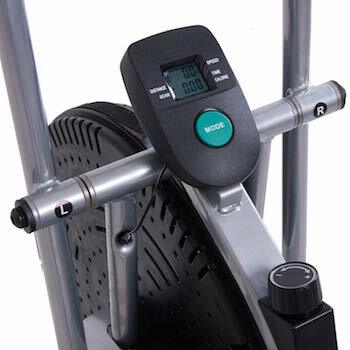 A scratch resistant, powder coated, 14-gauge steel frame and adjustable levelers keep this tough and affordable air bike sitting steady no matter how hard you push it. While not as comprehensive as higher end options, the built-in computer provides numerous metrics such as speed, time, calories, temperature and distance. A two year limited warranty may save you from having to shell out your own money for repairs or maintenance. Comfort and convenience features such as an adjustable seat and transport wheels add even more value to your purchase. A clean and simple high quality design gives the Marcy AirBike an attractive finish. 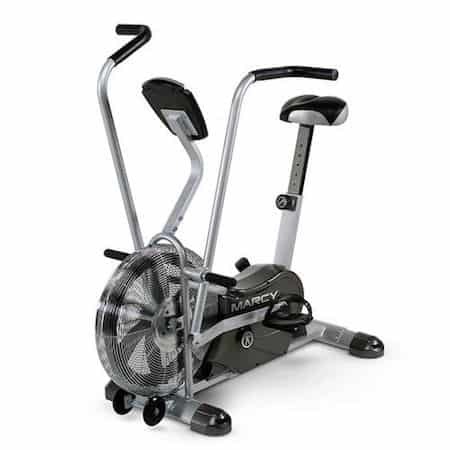 Body Rider’s air bike comes in at a significantly lower price point compared to the toys above. While this does mean a few compromises, such as an inferior computer and a noisier chain drive, it makes up for this in other departments. An adjustable seat with improved cushioning, for example. 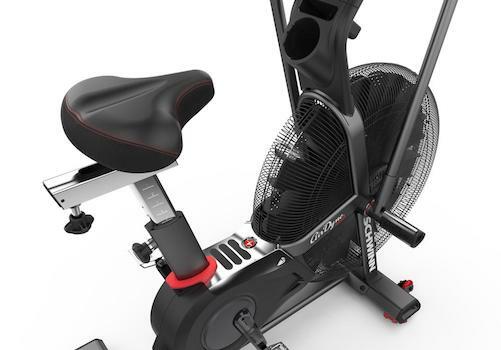 Body Rider’s air bike also features a knob that allows you to adjust the resistance level – something few, if any, other air bikes have. The frame and fan wheel are crafted from steel, providing enough weight to keep everything steady during high intensity bursts. 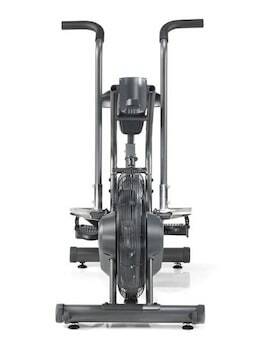 A decent air bike will likely set you back a few hundred to over a thousand dollars. It would therefore be wise to ensure that your investment will pay off. When it comes to design, air bikes are fairly similar across the board. However, some key differences in build quality and features make certain bikes stand above the rest. Here are the most important features to consider when buying your first air bike. The last thing you want is a flimsy, lightweight frame that wobbles with each pedal. Look for a bike with a stable, heavy gauge steel build. In the same light, built-in leveling feet and rollers will make moving and positioning your bike much easier. When it comes to your seat and handles, the more adjustable they are, the better. Some are interchangeable and allow you to put your bicycle’s handles and saddles on for a more familiar training experience. The best bikes feature a belt drive as opposed to a chain. While more expensive, belts are smoother, quieter and will last much longer. The digital display is where the quality of your air bike will show. It should be able to provide all the metrics you need, as well as workout modes, intervals and customization options. Support for additional tech such as heart rate monitors is a welcome bonus if you need it. Like any machine with moving parts, something is bound to break or require maintenance eventually. A comprehensive warranty that lasts long enough to cover any otherwise costly issues might just come in handy. You might have already noticed that air bikes are quite customizable. 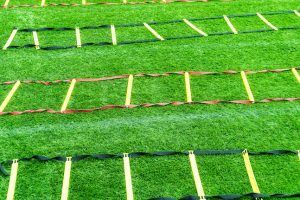 There are numerous accessories that you can add to make workouts more enjoyable. The first thing most athletes swap out is the seat. Having one that is both comfortable and sized for an optimal leg position is important. If you have cycling cleats, pedals that include a catch for you to clip your shoes onto are available. If you don’t have cleats, a pedal with a strap will go a long way in making your feet sit more comfortably. Just make sure that your bike’s pedals can be changed without causing warranty-voiding damage before you go ahead. Wind guards are another fairly popular option. Although these are only really necessary if your bike’s fan is producing more of a hurricane in your face than a cool breeze. Simple extras like smartphone and book holders are also available. Well, there you have it: The 6 best air bikes. 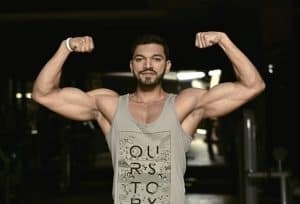 Any one of the above bikes will be an incredibly unique addition to your home or garage gym, and allow for gruelling cardio and strength workouts. If anyone tells you that using an air bike is boring, well that’s probably because they’ve never done much more than mindlessly repeat the same movement at the same pace. 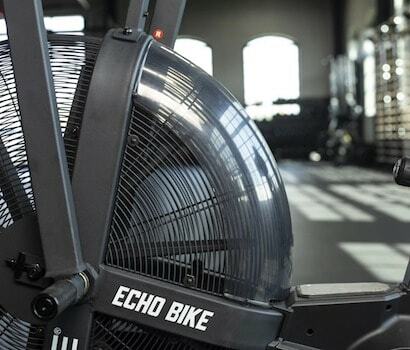 One of the main advantages of an air bike is how easily you can change up your pace, and how effective it is to do so. The three main ways you can train on an air bike are HIIT (High Intensity Interval Training), heart rate training and time trials. Each method essentially involves switching up the amount of time you spend exercising along with the intensity. Give them a try and see which one works best for you. Either way, you’ll be enjoying the considerable benefits of this one-of-a-kind workout. The best part is that not a single part of your body will feel left out. Put in the work and before you know it, you’ll look like a well-chiseled athlete who knows their way around a workout. Even if you just sat and pedaled air into your face all day.